He arrived in a cloud of (exhaust) smoke, four yellow plastic trays of curry puffs strapped to the back of his motorcycle. 'Puffs?' he asked, but we brushed him off. Yeah, yeah, curry puffs - a dime a dozen in this country. Besides, we were too focused on our clay pot of spicy gut soup to be distracted by mere pastry. Then he laid a tray on the table and lifted its clear plastic tarp to reveal the biggest, fattest, most beautiful puffs we'd ever seen. We reconsidered. We bought two. After finishing our soup and mopping our brows we pondered the puffs - exquisite works of pastry art they were, disks of layer upon layer of brittle golden dough folded over and sealed with neat pleats, their backsides a whorl of concentric circles. With the merest of pressure shards of light, croissant-like layers fell away to reveal more filling than one usually finds in three puffs put together. Every inch of the dough pocket was packed with spicy curried potatoes so savory I'd swear they were mixed with meat (but he said they were not). We wanted more. We stood up and looked around. But he was gone. The beauty and the agony of the itinerant vendor, bearing untold treasures but perhaps - probably - never to be seen again. For the Klang Valley's finest potato curry puff, try your luck in the vicinity of this restaurant in Seri Kembangan sometime between, say, 1 and 4pm (we didn't check our watches). One and a half ringgit per puff. Yes, relatively expensive for this common treat, but well worth it given the size, heft, and overall quality of this extraordinary puff. Oh my gawd. These are absolutely my favourite savoury snack ever (I know I overuse that phrase but honest, this one is). And what a spectacular specimen! Hi Robin, I think you can get spot them at Sunwaymas/Aman Suria area around lunch time (noon onwards) if that's any nearer for you. The guy wouldn't give us his hp no though. Apparently they are freelancing agents for a factory producing these great puffs. There are curry puffs and there are CURRY PUFFS. These are the most beautful ones I've ever seen! And I bet they taste just as divine! 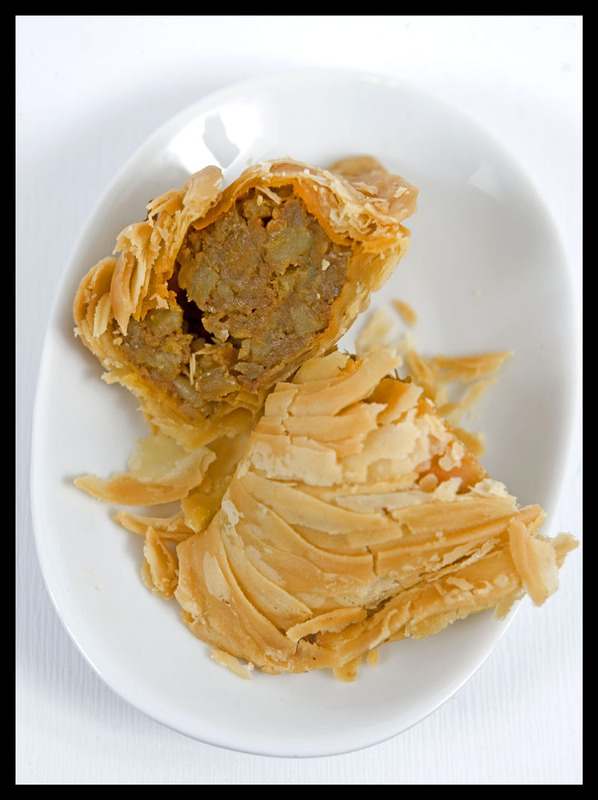 I am a huge fan of (good) curry puffs, and the ones pictured in this post look in-cre-di-ble! Curry puffs not readily available for sale where I live, alas (unless someone out there knows of great curry puffs in the San Francisco Bay Area?) I turn to the samosa to feed my cravings, but while good in its own way, it is (of course) just not the same. Thank you for this blog post, Robyn and Dave. Aw man. Those look too good. Now I have to track them down on my next trip! I think the potato curry puff now got a high-class name "vegetarian curry puff". 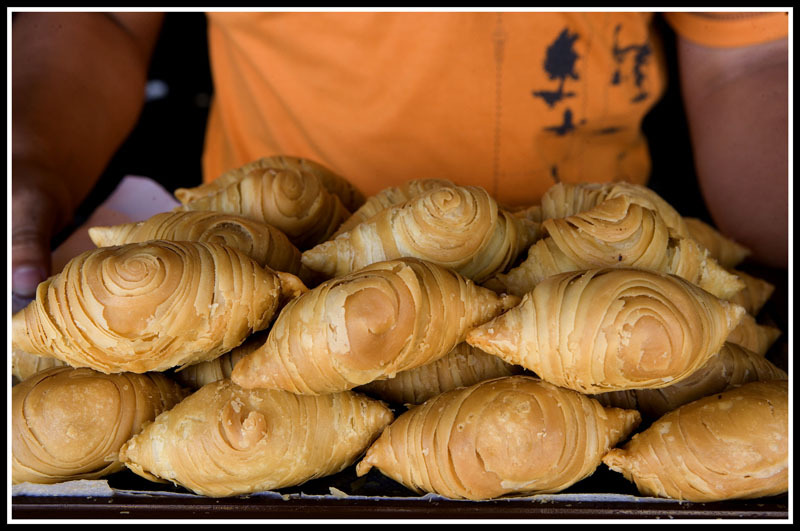 Have you try the curry puff at SS2 (outside Hock Seng 2 coffee shop)? It is not only potato, but got chicken and egg too. It is very delicious. Wow, those are gorgeous. Can't find good curry puffs in Hong Kong - will have to start experimenting on making my own. You ALWAYS make me hungry. Always. su-lin - truthfully, I can usually take them or leave them. But not these puffs! lips - thanks for the tip. pat - yes, I've had so many mediocre puffs. But these ... wow. Chris - I figured there must be some layering going on with the dough. santos - ;-0 I would never attempt something like this at home. I'd rather chase after the puff man. lmf - thanks for the tip. These may have been potato only but I'm thinking there was some animal fat in there, either in the dough or the filling. susan - this is a project for a looong wknd at home, that's for sure. jennifer - sometimes, as I'm writing, I make my own self hungry! Those are some awesome looking puffs. The pastry is so amazing. R&D, that's old school pastry right there, probably made with lard or shortening. It's not the short crust that most folks use nowadays for karipap. Great shot. I've been spending a whole day just looking at the gorgeous pictures and trying to live my foodie life through the words written here :) Just wanted to say that in Singapore, there's an A1 curry puff shop that has such styled curry puffs too. but I'm sure they aren't bursting to the seams like these in the pictures. Tastytasty though!